Feign Inferiority, Encourage Arrogance | SPACE-BIFF! My strategy to unite all rhyming provinces is often too transparent. 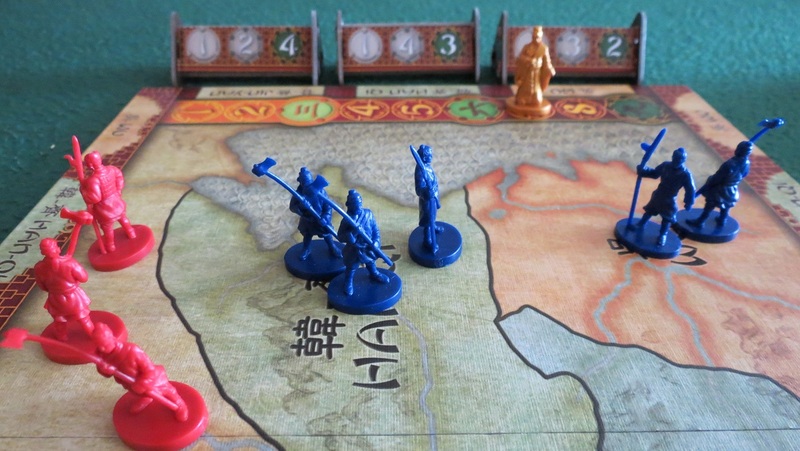 Matagot’s Sun Tzu is a slightly older game with a fresh splash of paint — but my oh my, what a splash. First published back in the aughts (2005, to be precise) by Jolly Roger Games under the title Dynasties, this newest deluxe edition treatment is nothing short of stunning. Stunning like a corpse-strewn battlefield at dawn. I breathe deeply through the nose, mouth curling upwards at the sight of my dismembered enemies. Um, yes, thank you Sun Tzu. Exactly like that. Or, perhaps it’s stunning because this deluxe edition could have taken on the same form as its predecessors, all wooden cubes and cardboard tokens and drab colors. Instead, Matagot has given us something unexpectedly beautiful for its price point and two-player limit. A vibrant, crisp map of Spring and Autumn period China. Detailed armed soldiery standing in for your armies. Little score-tracking tumblers that I’ll definitely be talking about in a little bit. And cards adorned with little sayings straight out of the pages of The Art of War. So rather than merely looking at a strength-5 card, you’re looking at a strength-5 card that advises you, An expert in the art of war avoids an eager enemy but attacks a dormant one; such is the art of psychological warfare. How cool is that? True, a few uber-nerds might not be able to shut up about how some of the quotes are paraphrases, but it’s still a fascinating slice of flavor that nicely sets the stage for the psychological game of wits Sun Tzu sees you playing. Attacks, retreats, arrows, and plagues. The basics couldn’t be more simple. Each round, you assign one card to each of the map’s five provinces, revealing them at the same time as your opponent. Some of the cards are reusable and return to your hand each round, all of them relatively weak, from the strength-1 card that lets you draw an extra at the end of the round to the strength-6 that can only be played once in each province over the course of the game. There are more powerful cards too, the same in both your and your opponent’s decks, stuff like whopping strength-10 cards, arrow barrages that always deal a higher value than whatever card your opponent played, retreats that do the opposite, and plagues that cancel your opponent’s move and halve the military population of the province it was played into. It’s a game of tug-of-war in two senses. Foremost, in each province as you swing the advantage back and forth between players, where the difference between your card and the one played by your opponent determines who adds troops to that region. It’s a game of bluffing and prioritizing as you try to control the highest-value regions by the time a scoring round occurs — which brings us to the more strategic level, where it’s possible to concede a few rounds in order to save your best cards for more important battles (and scoring rounds) later on. The twist is that gaining enough of a lead immediately ends the game in the leader’s favor, so it isn’t possible to hold everything back until the end. Those aforementioned score tumblers make all of this possible. Randomized each game and placed next to the board, these drive the conflict by showing just how many points each region is worth, both now and on future scoring rounds. Provinces grow and decline in value, a critical territory worth a lot now but potentially very little later on. Thus one more element to consider: should you bother dominating the region now with your best cards, even though the soldiers there might be useless later on? Or lock it down with a minimum of troops and hope the enemy doesn’t bank on precisely that sort of thinking? The production values are excellent. Adding even more depth to all these bluffs-within-bluffs are the warlord cards. Each side gets a unique set of these powerful single-shot abilities, and must choose one in secret at the beginning of each match. That might not sound like much, but that one card may very well determine the course of the entire game. 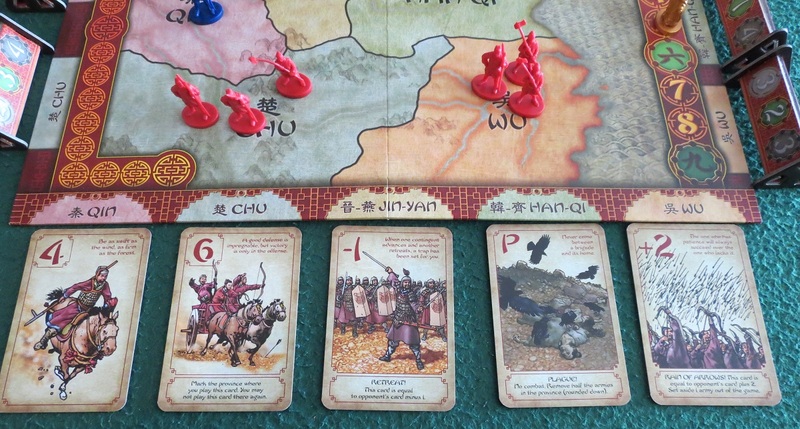 Sun Tzu, for instance, has the option of opening the game with the score tilted slightly in his favor, or pulling an ill-timed powerful card back into his hand; meanwhile, the King of Chu can ignore a plague at a critical moment or transform a regular plague into something truly terrifying, eradicating a province’s armies entirely in one fell swoop. To call them game-changers is entirely accurate. Recommended for people who have spent countless days memorizing The Art of War, and those few who have discovered the occasional better method of whiling away the hours. To both of you, I bid good luck. Posted on January 27, 2015, in Board Game and tagged Board Games, Jolly Roger Games, Matagot, Sun Tzu. Bookmark the permalink. 4 Comments. I picked up the older version of this game, Dynasties, just last year and am very pleased with how well it plays – not so much with its lackluster art. It’s a solid two player game so I’m glad to see it receiving more attention and better graphics. The card art on the new version is a huge improvement, and those new scoring tumblers really integrate well with the map. I’m still a fan of the wooden cubes over the new plastic figures, though. (Must be the Euro fan in me.) Compared with other two player games I really enjoy, I’d rank this one right up there with 2 de Mayo, The Duke and Omen as it seems to hit similar high points for creative play, tension and pure enjoyment. Agreed on The Duke and Omen for best two-player games, though I’d add Devastation of Indines and haven’t had the pleasure of playing 2 de Mayo. I’m in agreement: everything is improved but the lack of cubes. Which is why I put the soldiers in a baggie in the closet and replaced them with cubes from my local game store. Now it’s the definitive edition!